Humans have dramatically increased the spatial and seasonal extent of wildfires across the U.S. in recent decades and ignited more than 840,000 blazes in the spring, fall and winter seasons over a 21-year period, according to new research. After analyzing two decades' worth of U.S. government agency wildfire records spanning 1992-2012, the researchers found that human-ignited wildfires accounted for 84 percent of all wildfires, tripling the length of the average fire season and accounting for nearly half of the total acreage burned. "There cannot be a fire without a spark," said Jennifer Balch, Director of CU Boulder's Earth Lab and an assistant professor in the Department of Geography and lead author of the new study. "Our results highlight the importance of considering where the ignitions that start wildfires come from, instead of focusing only on the fuel that carries fire or the weather that helps it spread. 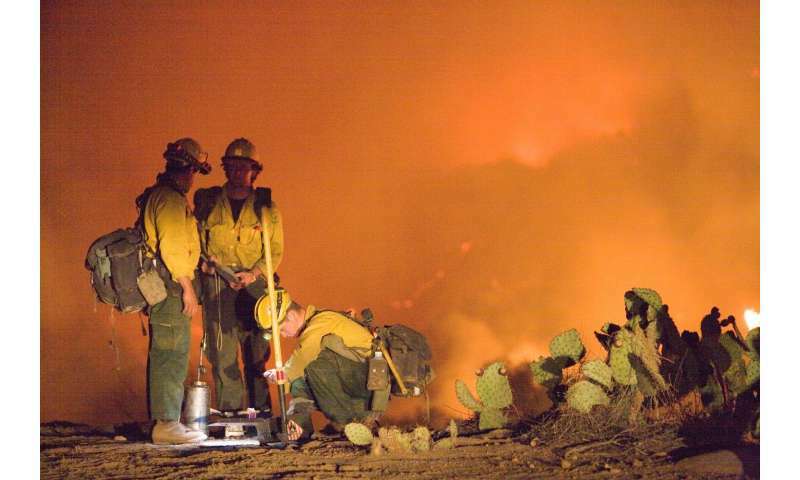 Thanks to people, the wildfire season is almost year-round." The U.S. has experienced some of its largest wildfires on record over the past decade, especially in the western half of the country. The duration and intensity of future wildfire seasons is a point of national concern given the potentially severe impact on agriculture, ecosystems, recreation and other economic sectors, as well as the high cost of extinguishing blazes. The annual cost of fighting wildfires in the U.S. has exceeded $2 billion in recent years. The CU Boulder researchers used the U.S. Forest Service Fire Program Analysis-Fire Occurrence Database to study records of all wildfires that required a response from a state or federal agency between 1992 and 2012, omitting intentionally set prescribed burns and managed agricultural fires. Human-ignited wildfires accounted for 84 percent of 1.5 million total wildfires studied, with lightning-ignited fires accounting for the rest. In Colorado, 30 percent of wildfires from 1992-2012 were started by people, burning over 1.2 million acres. The fire season length for human-started fires was 50 days longer than the lightning-started fire season (93 days compared to 43 days), a twofold increase. "These findings do not discount the ongoing role of climate change, but instead suggest we should be most concerned about where it overlaps with human impact," said Balch. "Climate change is making our fields, forests and grasslands drier and hotter for longer periods, creating a greater window of opportunity for human-related ignitions to start wildfires." While lightning-driven fires tend to be heavily concentrated in the summer months, human-ignited fires were found to be more evenly distributed across all seasons. Overall, humans added an average of 40,000 wildfires during the spring, fall and winter seasons annually—over 35 times the number of lightning-started fires in those seasons. "We saw significant increases in the numbers of large, human-started fires over time, especially in the spring," said Bethany Bradley, an associate professor at University of Massachusetts Amherst and co-lead author of the research. "I think that's interesting, and scary, because it suggests that as spring seasons get warmer and earlier due to climate change, human ignitions are putting us at increasing risk of some of the largest, most damaging wildfires." "Not all fire is bad, but humans are intentionally and unintentionally adding ignitions to the landscape in areas and seasons when natural ignitions are sparse," said John Abatzoglou, an associate professor of geography at the University of Idaho and a co-author of the paper. "We can't easily control how dry fuels get, or lightning, but we do have some control over human started ignitions." The most common day for human-started fire by far, however, was July 4, with 7,762 total wildfires started on that day over the course of the 21-year period. The new findings have wide-ranging implications for fire management policy and suggest that human behavior can have dramatic impact on wildfire totals, for good or for ill.
"The hopeful news here is that we could, in theory, reduce human-started wildfires in the medium term," said Balch. "But at the same time, we also need to focus on living more sustainably with fire by shifting the human contribution to ignitions to more controlled, well-managed burns." No, idiot, people have been making the same mistakes the whole time. With global warming they're more likely to get out of control, and can get bigger. Climate denial foolishness detected. Raise deflector shields and arm the phasers. AGW Cult FAKE "science".....dancing in the dark again. [qWith global warming they're more likely to get out of control, and can get bigger. There's more dry forest for more of the year. "Climate change is making our fields, forests and grasslands drier and hotter for longer periods, creating a greater window of opportunity for human-related ignitions to start wildfires." Maybe you should have read it first. Dumb da dumb dumb, dumb da dumb dumb duhhhh. Seems like a pretty obvious result to warmer, dryer conditions, but here's one of many studies on it: http://www.nature...omms8537 .